Cabbage contains powerful antioxidants which are supporting detoxification in the liver and removal of the toxins accumulated in the blood responsible for blemished skin. All your problems related to skin eruptions like eczema or acne can be solved by placing some grated cabbage on the affected area. The reason behind cabbage usage in beauty products is ability to rejuvenate skin and fight infection at the same time. You can use cabbage for hair care too. Just by drinking raw cabbage juice daily you can stop hair loss and make your hair stronger. Cabbage is a rich source of sulphur, a chemical element used as effective acne treatment for many years. Because of that, if you have mild blemishes or moderate acne, you may try to eat more cabbage or better yet, use it topically. Silica is one of nutrients that help us grow out our hair, improve hair texture and feed our follicles. This powerful beautifying micro nutrient is responsible for collagen synthesis and has amazing benefits for hair care. It is important to have enough potassium in your body, an electrolyte that adds moisture to the skin, and makes your complexion fairer and smoother. 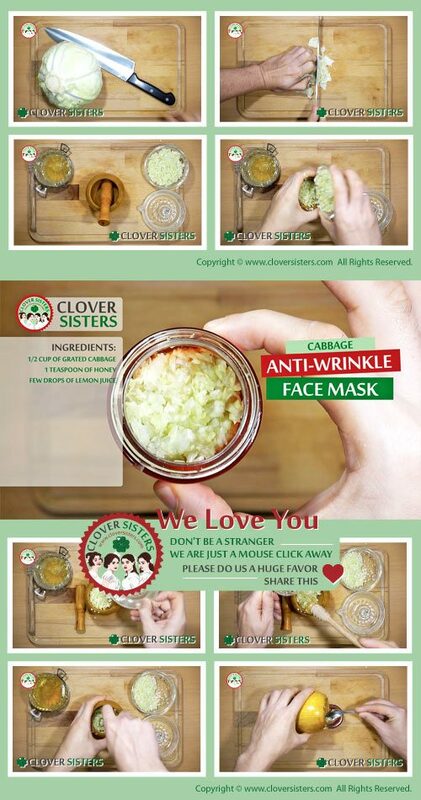 Cabbage is a rich source of potassium and a great natural way to maintain a clear complexion. Take half a cup of grated cabbage and crush it in mortar then add teaspoon of honey and few drops of the lemon juice. Apply to face 3 times a week.